It's time for another Tuesday Throwdown challenge! This time we are using the above sketch, and our sponsor is Wink Wink Ink. This adorable image I used is called Rainy Day. Please visit their website to see all the adorable images they have to offer! Thank you to Wink Wink Ink for not only providing an image for the design team to use, but for being a great supporter of Tuesday Throwdown! I colored this cutie with Copic markers and used a decorative circle die cut to cut it out. 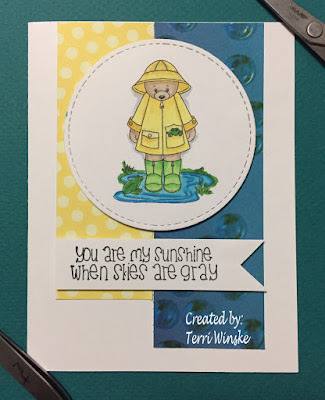 I found these awesome scraps in my never-ending scrap stash and this sentiment in the Hello Sunshine set from Fun Stampers Journey. A quick and easy card. Check out our challenge this week and get your project uploaded for a chance to win an awesome prize from Wink Wink Ink!! I appreciate you stopping by - thanks!! 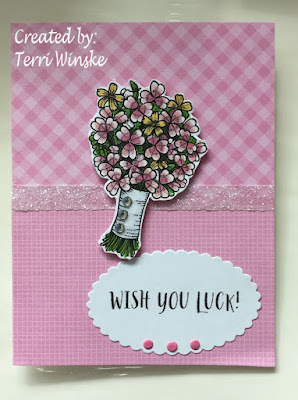 Welcome to PIP Challenge 1916, an Anything Goes challenge, sponsored this week by Sparkle N Sprinkle. This image is called "Baby, Oh Baby". I love her facial expression! Please visit their website to see all the wonderful images they have! I colored the image with Copic markers and layered it on a die cut oval. 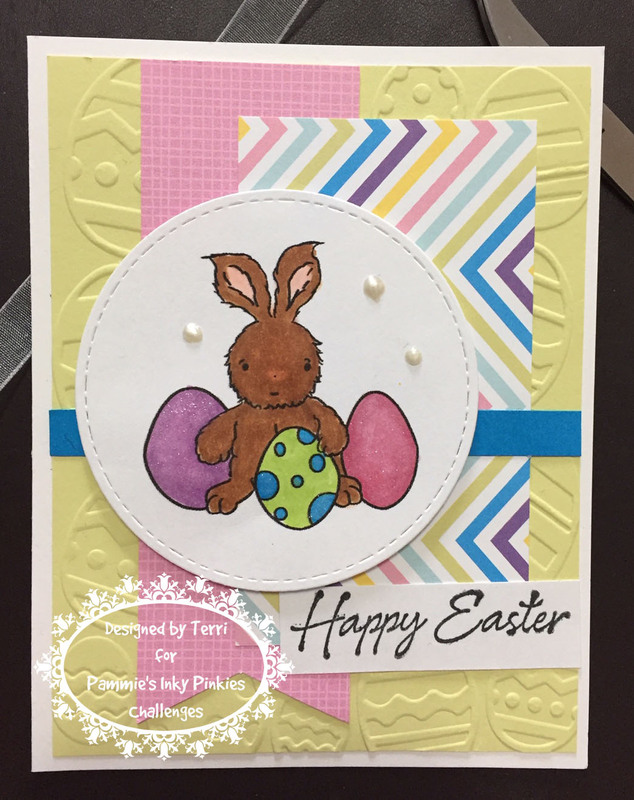 The embossing folder was sponged with pastel color inks using daubers. The sentiment is from Sparkle N Sprinkle as well. Check out our challenge this week to see lots of great inspiration from the other design team members. Be sure to uplink your creation for a chance to win an awesome prize from our sponsor. Thanks so much for stopping by.....have a great week. Hello, and welcome to PIP Challenge 1915, an Anything Goes challenge, sponsored this week by Di's Digi Stamps. This adorable image is called "Train for Ted" Please visit Di's Digi Stamps to see all the great products they have to offer! Thank you to them for being such a great supporter of PIP Challenges! 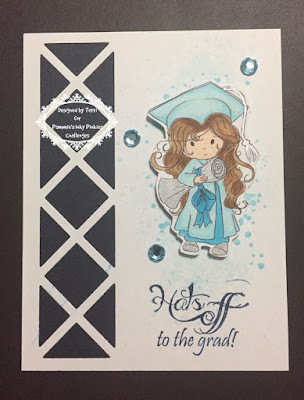 I colored the image with Copic markers and used a Darice embossing folder for the blue piece and a swiss dot embossing folder for the brown piece. 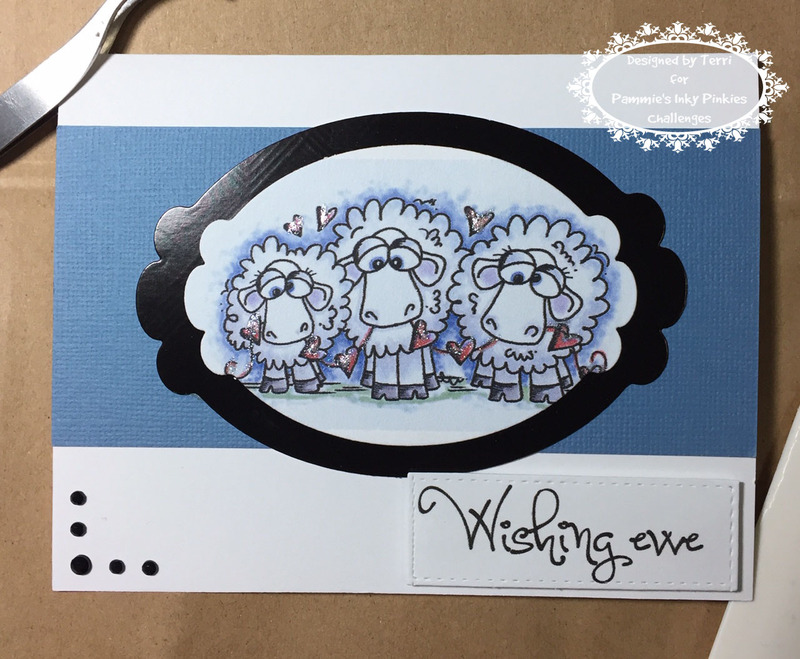 The sentiment is from Fun Stampers Journey. You can find our challenge this week HERE. Be sure to get your creation linked up for a chance to win a really nice prize from Di's Digi Stamps. Have a great week! 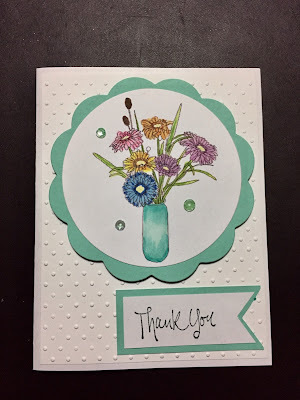 Welcome to Tuesday Throwdown Challenge 429, an Anything Goes challenge this week, sponsored by Kitty Bee. Thank you so much to Kitty Bee for providing this adorable image to use - it's called Jungle 7. Please visit their website to see all the adorable products they have to offer! 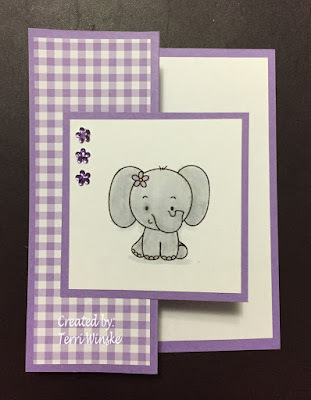 I colored this little cutie with Copic markers and used gingham paper and cardstock from Stampin Up. A few purple flower gems finished off the card. 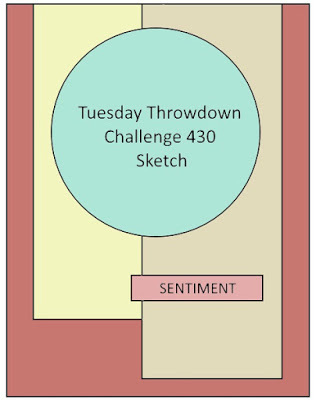 Check out our challenge this week at Tuesday Throwdown to see some awesome inspiration from the other design team members. I appreciate you stopping by - Thank you!! Happy Monday, and welcome to PIP Challenge 1914, an Anything Goes challenge, sponsored this week by StarStampz. Please visit their website to see all their great products! This image was colored with colored pencils. 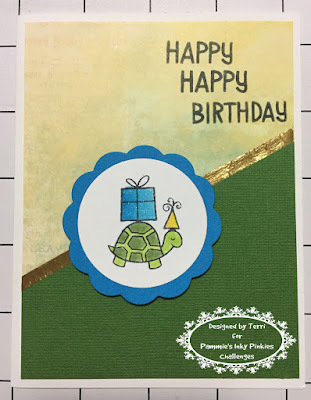 A friend of mine shared this water bubble paper with me - what a great match for this card! And the base is embossed with a Swiss Dot embossing folder. Please check out our challenge this week to see some great inspiration from the design team, and be sure to get your creation uplinked for a chance to win a very nice prize from StarStampz. Thanks so much for stopping by! Welcome to PIP Challenge 1913, sponsored this week by Morgan's Artworld. Check out all the wonderful products they have to offer at their website HERE. I colored this beautiful flower image with Copic markers and added a die cut scalloped circle. I went with my all-time favorite embossing folder (Swiss Dot) and added a cute little thank you tag. A few sequins finished off the card. Please visit our challenge this week for a chance to win a very nice prize from Morgan's Artworld. Thank you to Morgan's Artworld for being a great sponsor and to you for stopping by. Have a great week! Happy Tuesday, and welcome to Tuesday Throwdown Challenge 428, sponsored this week by Sparkle N Sprinkle. I so love their images, and you can check them all out at their website HERE. Our theme this week is pastel colors, and I used a pastel green for the background paper embossed with a Stampin' Up Tufted embossing folder. 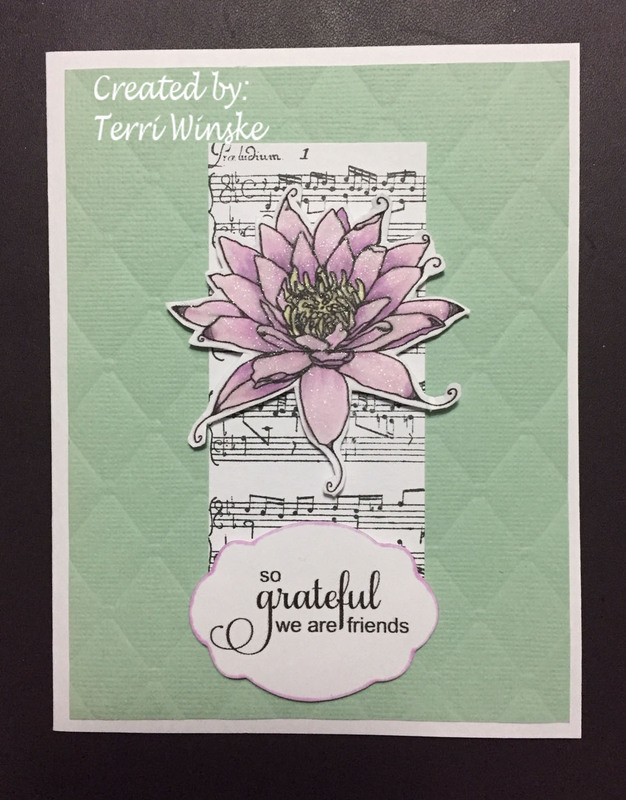 I layered a piece of white cardstock stamped with a Stampin' Up music background stamp next, and on top of that was my flower image. I colored it with Copic markers and used Spectrum Noir sparkle marker on it. 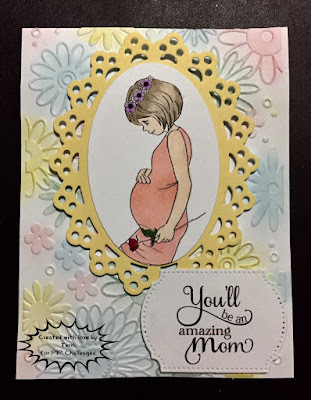 The sentiment is from Sparkle N Sprinkle die cut and outlined with a Copic marker. Please visit Challenge 428 to see some great inspiration from the other design team members, and uplink your creation for a chance to win a really nice prize from our sponsor. Thank you very much for stopping by! Welcome to PIP Challenge 1912, an "Anything Goes" challenge sponsored this week by Polkadoodles. Thanks so much to Polkadoodles for providing an image for the design team members to use. You can see all their great products HERE. This cutie is called "Graduation You Passed". 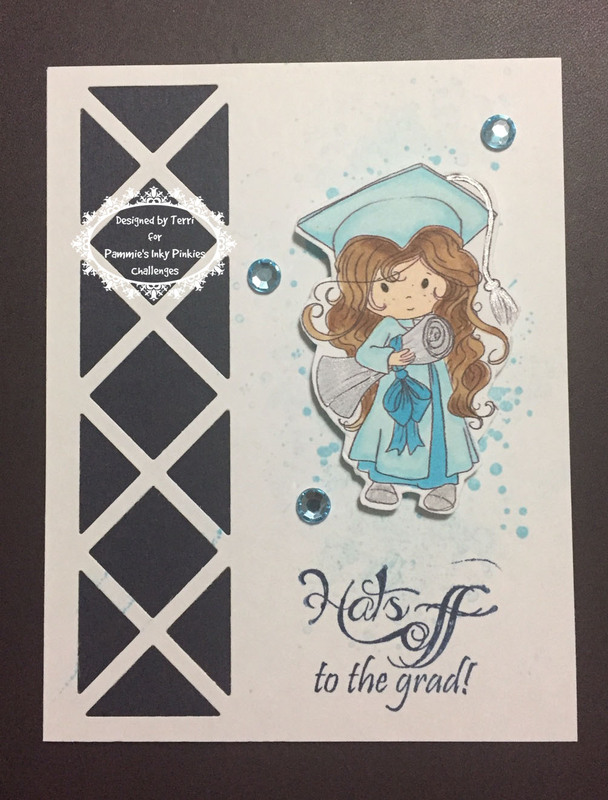 I used Copic markers to color the image and added a silver marker to the tassel and scroll. 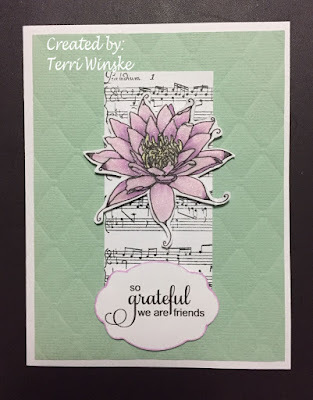 The sentiment is from Fun Stampers Journey, and I can't remember where the die cut is from - sorry! Please check out our challenge this week and uplink your creation for a chance to win a great prize from Polkadoodles! Looking forward to seeing you there! Thanks for stopping by - have a great week! Welcome to PIP Challenge 1911, sponsored this week by Lawn Fawn. 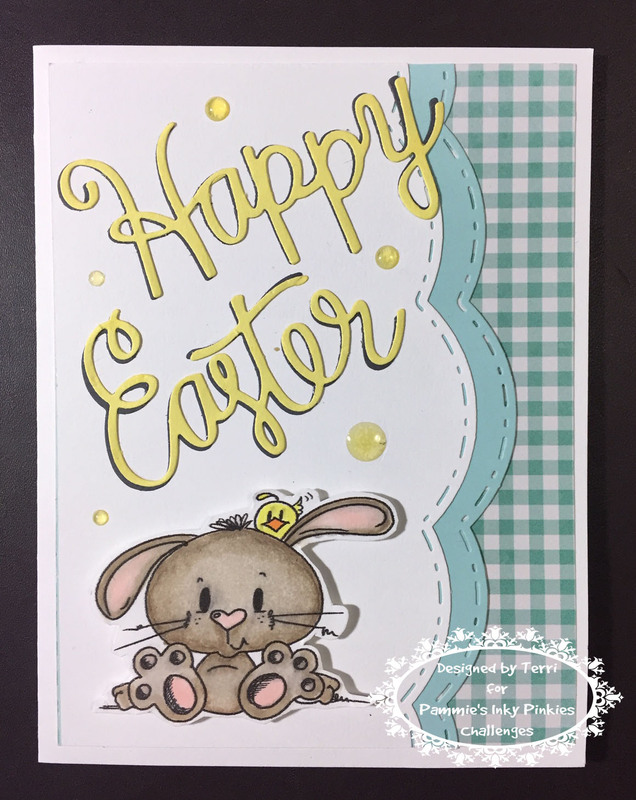 I am a big fan of Lawn Fawn, and selected this cute and adorable "Year Two" set to work with this week. It has matching dies, too! Thanks so much to Lawn Fawn for being a super supporter of PIP Challenges!! Visit their website to see all the great products they have to offer. I used Copic markers to color the image and chose a CAS layout so this little cutie could be highlighted. 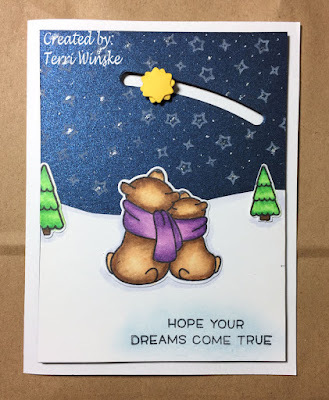 A few pieces of paper from my stash, a piece of curling ribbon and a touch of Spectrum Noir sparkle marker on the present and hat finished off the card. 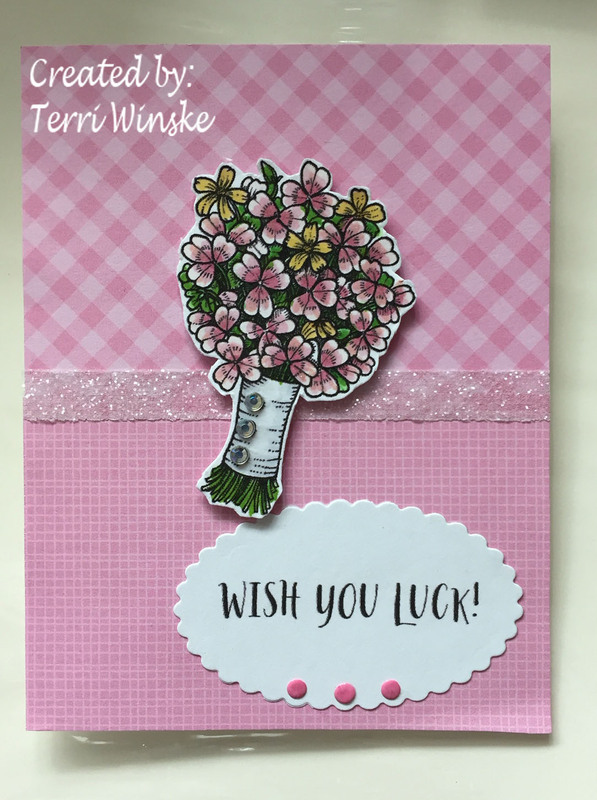 I do hope you'll join our Challenge 1911 for a chance to win a $25 code from Lawn Fawn - that's such a generous prize....and one I'm sure everyone would want to win. So excited to see what you create! It's Tuesday, and you know what that means! Yes - time for Tuesday Throwdown Challenge. This week is Challenge 427, sponsored by Power Poppy. Thank you so much to Power Poppy for these lovely designs for us to work with! Be sure to check out all their wonderful products HERE. 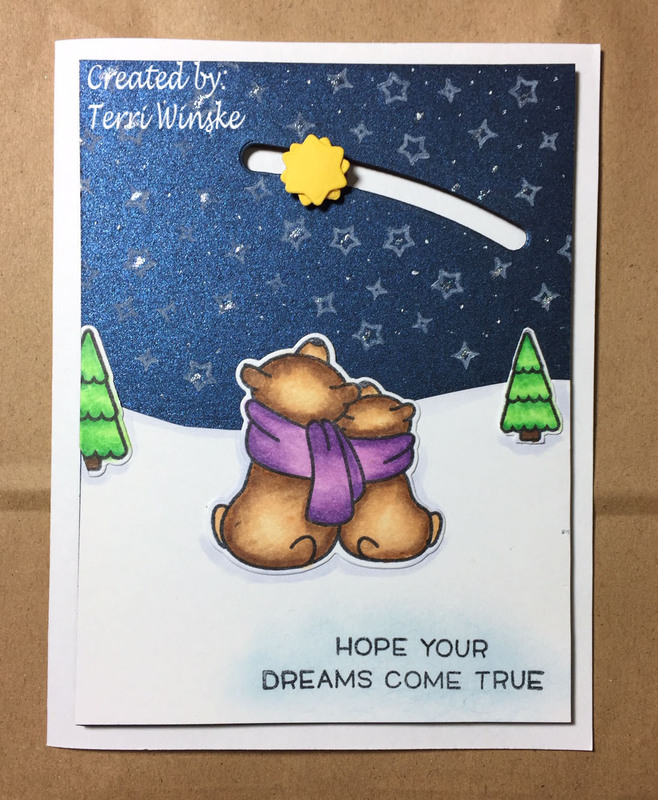 I colored this "Wish You Luck" image with Copic markers, picked out some coordinating papers from my scrap box and added a sparkly ribbon. I die cut the sentiment and added a few pink enamel dots. Thank you very much for stopping by - be sure to visit Challenge 427 to see some great inspiration from the other design team members. Link up your creation for a chance to win an awesome prize from Power Poppy! Welcome, welcome, welcome! It's time for PIP Challenge 1910, this week sponsored by the lovely Limited Runs. So happy to have them as a sponsor, and thank you to them for this cute Easter Bunny image to work with! Please be sure to check out their website to see all the awesome products they have to offer!! I colored this with Copic markers and added a little Spectrum Noir sparkle marker to the eggs. 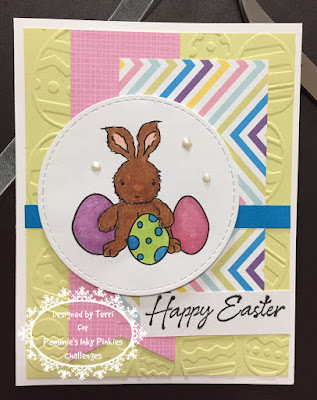 I grabbed some papers from my scrap box and used a darling Easter egg embossing folder. I layered it all up and added a Hero Arts sentiment. Please be sure to visit our challenge this week to see some great inspiration from the other design team members. We hope you will join in our challenge for a chance to win some digital images from Limited Runs! Have a great week! 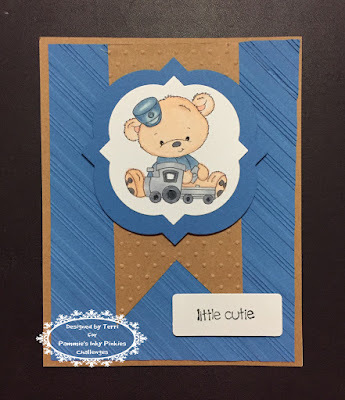 Happy Monday everyone, and welcome to PIP Challenge 1909, an "Anything Goes" challenge sponsored this week by Bugaboo Stamps. Thanks so much to Bugaboo for being an awesome sponsor of our challenges and providing an image for the design team members to use. I chose this adorable Bugaboo Bunny. Couldn't resist this face!! Please visit Bugaboo Stamps to see all their wonderful products!! 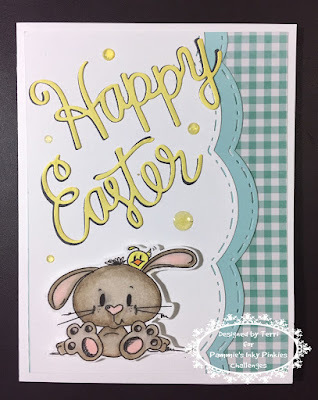 I colored the image with Copic markers and used a Happy Easter die cut from my stash (sorry, I don't know who it is from). I cut it twice, once in dark gray and once in yellow and layered them. I used paper from my stash - gingham always reminds me of spring! A few enamel dots finish the card. You can check out our challenge HERE to see some awesome inspiration from the other design team members. Be sure to get your card uplinked for a chance to win a prize from Bugaboo Stamps. Looking forward to seeing what you create! Welcome to Tuesday Throwdown Challenge 426, where our theme is Interactive design. Your project should include an interactive element. We are sponsored by Lawn Fawn. Please visit their website to see all the awesome products they have to offer. These images are from the Winter Skies set. I colored the images with Copic markers and used a slider die cut to make the interactive part. This was my first slider card, and I was surprised at how easy it was. Please visit Challenge 426 and check out all the great inspiration from the other design team members. Then get your project uplinked for a chance to win a fantastic prize from Lawn Fawn! Can't wait to see what you create!! Happy Monday, and welcome to PIP Challenge 1908. Our sponsor this week is Sparkle N Sprinkle. Please visit their website to check out all their awesome products!! Thank you so much to Sparkle N Sprinkle for providing an image for the design team members to use. This adorable image is called "Will Ewe Be Mine". It is a pre-colored image that I cut out with a layered die cut, first the image, then a glossy black background. This was layered on a piece of blue cardstock from my stash and finally on white cardstock. The sentiment was cut out with another die cut and mounted with pop dots. The inside sentiment says "A Wonderful Day". I added a few black gems in the lower left corner. Please visit our challenge this week and get your project uploaded for a chance to win an awesome prize from Sparkle N Sprinkle. Thanks very much for stopping by!